Indiana State University's mascot is the subject of a new children's book by ISU alumnus Brian Hasler. "The Story of Sycamore Sam" is a fictional account of how the mythical "furry, woodland creature" came to serve as the Sycamores' mascot. Colorfully illustrated by Angela M. Gouge, the book tells a rhyming tale of how Sam, "too big for a fox, and yet like a fox he did look," had fur that changed colors depending on the seasons. But Sam's heart was blue and he longed to be "part of something much larger than he." His big chance came when he auditioned to become the Indiana State mascot and soon after he was selected his coat changed permanently to the familiar Sycamore blue as he cheered the university's sports teams on to new heights. Hasler's book encourages youngsters to be like Sam by giving to others and making the world a brighter place. "Sycamore Sam is a great mascot, and one that children particularly identify with," Hasler said. "Telling the story of how Sam came to be our mascot is a great opportunity to remind young and old of what Indiana State University is all about: educating students to become great citizens and to make a difference in the world around them." 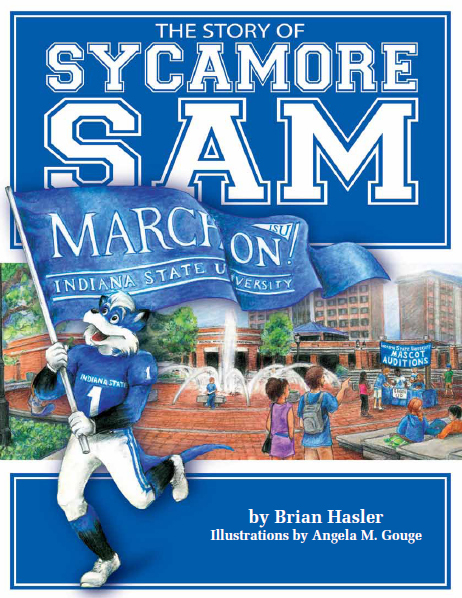 Published by the Indiana State University Alumni Association, "The Story of Sycamore Sam" will be on sale Saturday outside Memorial Stadium during "Tent City" in conjunction with ISU's homecoming football game. Hasler and Gouge will be available to sign copies. The book will also be available soon at the Barnes & Noble/ISU College Bookstore in Terre Haute. Book readings, live illustrations and signing events are also planned in the months to come. Hasler is a 1980 ISU graduate who currently serves as special assistant for external relations in the office of ISU President Dan Bradley. "The Story of Sycamore Sam" is his second collaboration with Gouge. Their first book, "Casper and Catherine Move to America: An Immigrant Family's Adventures, 1849-1850," was published by the Indiana Historical Society. The story followed the path of Hasler's great-great grandparents and their children as they made their way to Indiana from their native Switzerland. Hasler lives in Indianapolis with his wife Maggie and their three children, sons Hugh and Harry and daughter Rowan. Gouge works as a graphics art director and illustrates children's books in her free time. In addition to the Sycamore Sam book and "Casper and Catherine," her books have included "Parker My Guardian Angel" and "Buttercup," which she co-authored. She enjoys working with a range of art media, including portraiture and painted wall murals. She lives in central Indiana with her husband Stephen.